In addition to being found in almost every bathroom, mirrors are typically an option included in a home when a small space is wished to appear larger. 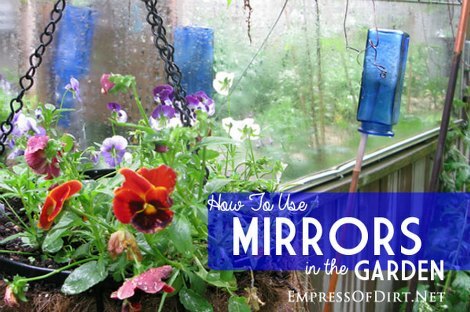 However, there are a few uses of mirrors you may not have thought of, like using mirrors outdoors in your garden. If you want to update the look of an outdoor space, then adding mirrors in your garden is an inexpensive option. Mirrors in your garden can be the easiest way to add a new design element to the landscape. One thing to keep in mind is you might not want to use mirrors that are designed for indoor use. You can easily replace all the glass in an old-style window frame with mirrored glass. Hang the newly made “window” on a fence or from a free-standing brace behind a particularly beautiful plant. This is a great way to update any garden area to make it look like a livable space. The key to having mirrors in the garden is making sure the material is weather resistant. Just remember that mirrors in the garden can be placed anywhere they are not a hazard. If you use any mirrors or other glass that can easily break, then there is the danger that you or your outdoor animals could be injured.